Natalie has finally bonded with a stuffed toy. Her toy of choice is... Elmo! She can say "Eh-moh" very clearly and asks for him to help her sleep. She also likes to do things together with him like put on socks, sit on her chair, read books, and he some times will even accompany her (from afar) to eat. Since she loves Elmo sooo much and since we have just begun to introduce the TV into her life, Natalie is now allowed to watch (at most) 10 minutes of Elmo everyday. She watches the same episode and she LOVES it. When the opening music starts, she'll wave her hands in the air to dance along. When Elmo comes out on screen, she'll usually screams in excitement. Watch Video 168 of Natalie watching Elmo. You can see her stuffed Elmo next to her on the sofa. 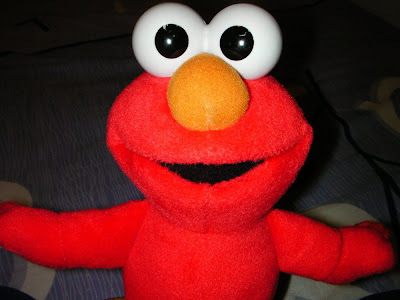 Natalie's new and loyal friend, Elmo. He's a soft plush toy with plastic eyeballs. Natalie likes to hold him by the eyeballs.